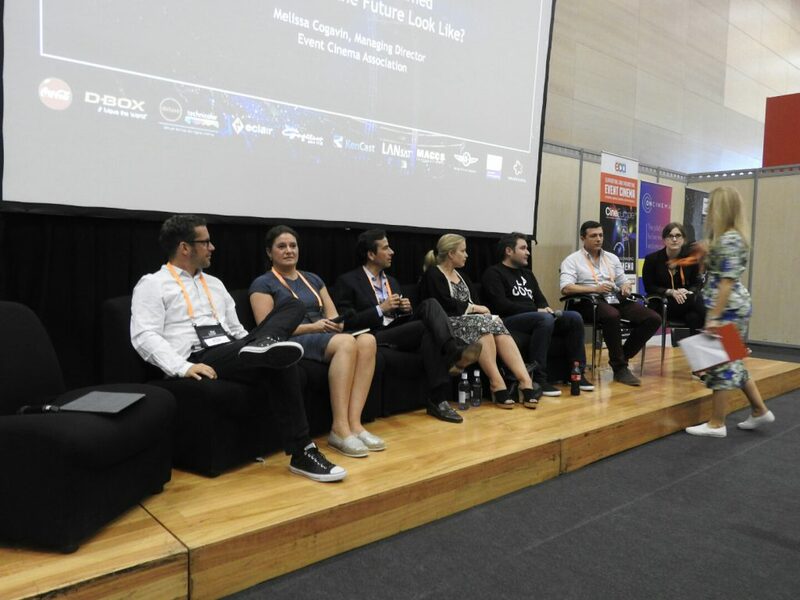 This is a live transcript of one of the many seminars and presentations at CineEurope 2016. As such it may contain errors and omissions that are more likely than not the fault of the transcriber (yours truly) than the speakers. Sometimes we condense or abbreviate points being made. The text may sometimes not make complete sense as it was made to be heard rather than read. But every effort has been made to present what was said as accurately as possible. The most well attended Focus Session at the trade show floor’s conference pen was the Event Cinema Association’s “10 Years of Event Cinema: What have we learned and what does the future look like?” – almost as popular as the ECA pool party that seems to get more and more packed each year. Next year they will need inflatable pool mattresses to accommodate all the guests. Let me begin by seeing how far we have come as an industry. Event Cinema industry is officially in its tenth year. Burst of creative excellence as a result. Thank you to all of those who played an integral part in making this happen. comScore and IHS helped us provide data that proves the industry is thriving. Patchy data shows that we still have some way to go to match the transparency of the studios. Daily figures are hard to come by. We are still young and the market is far from settled. We need to get to grips with this as an industry. This is truest picture we have but not whole picture. Record breakers skews the patterns. France is doing extremely well but we don’t have much data to go on. So France is doing well but we don’t have the figure. Worry that industry that plateaued, but you can’t have exception year each year. Mylene Farmer’s “Feeling Great” concert was for one night only, [but its success] distorted the market the following year. You can look at it as revenue per country relative to population size. Things looking good in Australia. 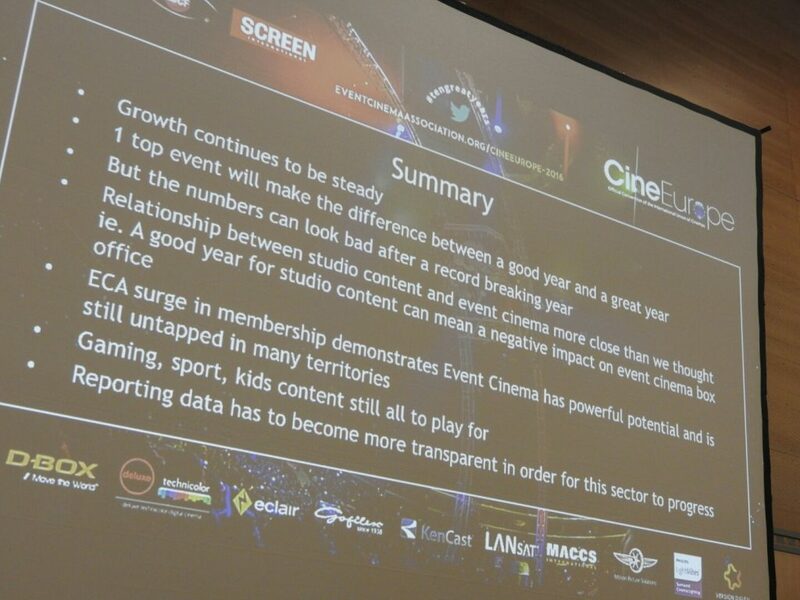 Over last three years CAGR of event cinema in the UK of 51% while film was 0.1%. We have to put all this into context. We have established a relationship between mainstream audience for studio films and event cinema audiences. The reason event cinema [declined in relative terms] in 2015 is because studio titles did well. Six major franchises in 2015, this dug into event cinema more than anyone expected. But a slow year for studios means a good year for event cinema. There is an unfortunate reliance on top product to keep things over. Putting all your eggs in one basket is dangerous. Equally true for event cinema as it is for Hollywood studios. Looking at Secret Cinema therein a similar lesson, where one film (Empire Strikes Back) outperformed all the others since. For advanced markets like UK you need unique products, whether Secret Cinema or NT Live. ECA has seen a 50% surge in membership in 2016. Growth in US and now represented by Thomas Schuelkee In Germany. James Dobbin, National Amusements: James chairs the panel discussion about event cinema, asking about the overall importance of it to the bottom line for cinemas. Marc Allenby: It has been incredibly important. Grew from one screen every there months to a screening every week to delivering a regular audience and income steam. 15-20% of gross box office in a year and even in a particular cinema can be [as high as] 50%. 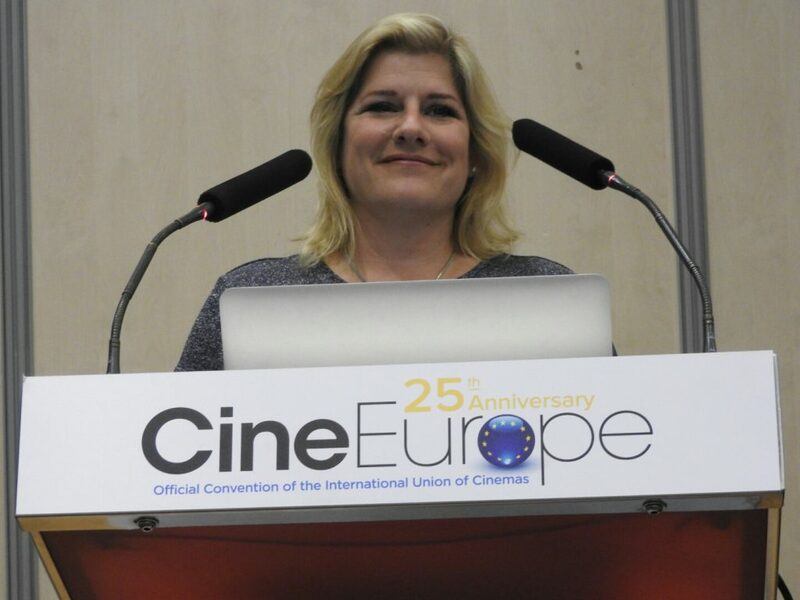 Monica Törnblom: Some of our best cinemas have up to 53% of BO from event cinema. Mainly the managers in charge of the cinemas [are responsible for this success]. They are not from cinema background but music and theatre backgrounds. They think outside the box. Nicole Heim: Everyone who watches classical content like Met Opera can see that they are older people who have not been to the cinema for 10-20 years. And they say they had no idea it was so easy and nice. They have learned that they are visiting normal content, like arthouse movies or films for older audiences. James Dobbin: I’m fortunate to have done it for nine years. Initially we though sports and music would dominate, but it is arts that’s been big. Music has been let down, no? Franco di Sarro: Many factors. Many times there is not the correct selection of content. Music content varies country by country. It is very sensitive, the support driven by the artist. We see content made for DVD releases and we try to bring it into our cinemas. The connection with the talent and the label is absolutely the essence of it. 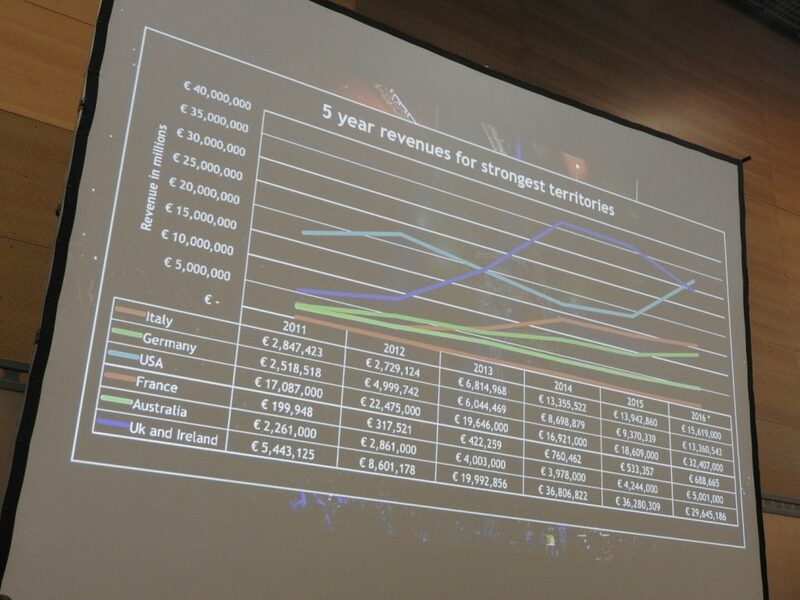 Alban Dechelotte: Gaming is bigger than you think. The other thing is that people are more passionate than you realise. People watching other people play games. Yes, really. 280 million ever week. This is huge. One of the big things, you probably have tried soccer games in theatres, you compete with bars. The great things about eSports is that you get more people, more than MBA. 45 million people. But it is not available on TV. The only alternative to cinema is to watch it on the laptop. So the theatre is the second best experience apart from being in the venue. We don’t know if eSports will make it into TV. So there is aged potential for theatres. Monica Törnblom: We did a Black Box venue, where they created build up to bars and they had good relationship with bars, and hiphop community and the live screaming was just one part of the whole evening. Franco di Sarro: We create every year about 48-50 events per year. In this slate it varies from fine art to documentaries to classic films. We also did anniversaries. Like the holocaust in January. We showed a Margaret Trotta film and we did 40,000 euro working with the Jewish community. We did something for the anniversary of Amy Winehouse. 1.1 million euro in dead days. “Back to the Future” Day, we built up a lot of events around the country. 550,000 euro in on night. Marc Allenby: There is still clearly growth but there is also saturation in the market. The quality productions with wide appeal will find audiences and dates that break records. “Hamlet” and “Winter’s Tale” within a month of each other did great at the BO. By and large the market is in a healthy place. Challenge is to work together that we are not cannibalising each other. Franco di Sarro: This year we will do Royal Opera House and art content that is great opportunity to mix the two foundations. 22 events is already a great number in a country like Italy. It is basically an event per week. Lucy Barclay: We lo do theatrical campaigns, so it is important to learn from film audiences. We worked with Picturehouse to analyse data from cinema, for films such as Amy, so we see overlaps. So we worked on Facebook and we serve out our campaigns based on media consumption. Our role is to expand that. We have that audience there, but who else would it appeal to. One campaign we were bold with was Monty Python, so we had social, but it was important to make a big announcement. We had media running in places you wouldn’t expect adverts for event cinema to be running. Posters and press ads as final call to action. Marc Allenby: Look at how you can adapt the campaign as it is running, based on what is working and what isn’t. Monica Törnblom (who looks after 180 individual sites): Manager is essential. Event has to be built from local market. It is local marketing that is most important. It is all about the content itself, that is where it starts. If the content is perfect, you have to communicate it to audiences that this is special and you only get this here. We have 80 screenings of alternative content [!] in a year. There is a lot of work to start and create things from scratch each time. I can reach opera audience with Facebook. Franco di Sarro: We act in different ways depending from territory to territory. We try to find in each territory the suitable sub-distributor who knows the country. Better than us. Investing more country in marketing and advertising. Gives the content owner the opportunity to gain more form the market. We don’t just have the theatrical rights. Monica Törnblom: Encores are very important for us so we can maximise revenue. A lot of audiences don’t want to go out on Saturday night, so they go weekday or daytime. So our venues try different days and see what works best for them. It is a good long tail effect. NT Live did study 47% did not go because timing was inconvenient. Nicole Heim: We don’t do encores because the live aspect is a unique selling point. We put it into communication that you can only catch it this one night. Simon Tandy: On the local level there are a lot of hardware solutions, which gives different abilities to record and show the next da. you still have to QC. Vendors like us will work with content owners. Alban Dechelotte: (Gives example of Overwatch.) Let me explain what a beverage maker is doing in cinema. We have worked with cinemas for over 100 years. In order to add value we have a recognition that audience is aging. You need to recruit new audiences. I was in charge of sponsorship, We looked at football and more. Three years ago we started small and organic. We feel it is a way to add more value to our partners. We need to re-engage audiences with cinemas. We asked people to buy tickets for something they can get online for free. So we create an event in the cinema. They go with friends. They get a gift. They get a great experience on the big screen. Content is elsewhere, but we add value. We partnered with a publisher that had a new game, so we did a launch party the day before. So fans could watch favourite teams doing it. We gathered all the trailers, so much so that we had one hour of content. We did a panel. That gave you 90 minutes of content that sold out in 16 countries in just a few days. We combine live events and pre-recorded content. It is all about how exclusive it is. James Dobbin: Pre-release and marketing is interesting and perhaps we should be doing it with music. Marc Allenby: For Nick Cave we are doing “One More Time With Feeling”, so you can hear the album one day early. And you can see a feature film specially made for it. It is made to be more than a marketing stunt. It has the full engagement of all the stakeholders. Having those vested parties pulling in same direction it is essential for its success. We have sold out in Berlin, Stockholm, London. Creates scarcity. Music can be made to work with the right motivation. James Dobbin: We have looked at pre-school audience. 2.3 million for Peppa Pig and 4 million euros for Masher. Nicole Heim: ‘Mitmachen’ by Disney. It was just 60 minutes. Children did not have to sit, they could stand or dance. This worked absolutely perfect for our audience. We have fans amongst parents who would love to go with their small kids to cinema on a regular basis. If I could say every first Sunday afternoon I have a 60 minute show for small kids, because parents like us to have offers like this. Alban Dechelotte: We are very excited about music, but we are careful. Every time I expect something to work it fails and when I expect it to fail it crushes it. So music has a legacy with Coke, so we try to excite them. Monica Törnblom: In Denmark the independent cinemas have been blocked from the bigger events by the big cinema chains. In Norway, I don’t know why they have not had success [with event cinema], but they have focused a lot of technical upgrades. Such as Atmos. Simon Tandy: From a technical perspective we always face issues of cost. Looking at Asia, perhaps IP delivery when’re you have economies of scale. Franco di Sarro: China is a big show. We had success in access to Japan and South Korea. Especially with art documentaries. Driven by technological high end productions. We did an event on Boticelli’s Inferno, based on the Dan Brown movie adaptation. This will be big in China too.